Sports is moving to the internet. But the internet still isn’t ready for sports. 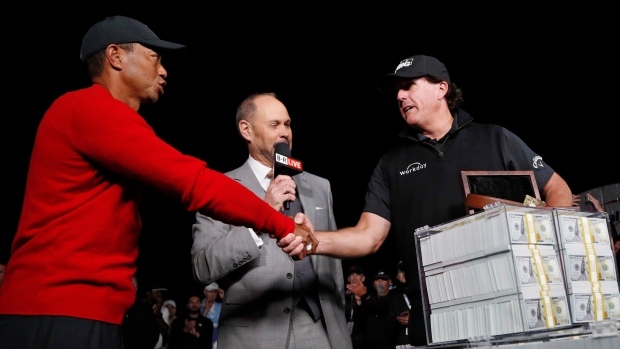 Media giant AT&T Inc. (T.N) was forced to make a pay-per-view golf match between Phil Mickelson and Tiger Woods free to watch on Friday after suffering a glitch processing customers’ online purchases. It marked the latest botched attempt at streaming sports online, a trend that threatens to undermine television’s transition to a digital future. From Walt Disney Co.’s (DIS.N) ESPN to Amazon.com Inc., more companies are broadcasting major sports on the internet, which can be more prone to problems than cable or satellite TV. Even technology giants are having trouble. In August, Amazon had problems live streaming the U.S. Open for U.K. viewers, with fans complaining about poor picture quality and functionality. In July, YouTube’s TV service crashed while England and Croatia played in the World Cup semifinals. In February, some Hulu viewers got error messages during the final moments of the Super Bowl. Perhaps the biggest example came in 2017, when Floyd Mayweather and Conor McGregor met for a highly publicized boxing fight that cost US$100 for a high-definition stream. NeuLion, which was UFC’s streaming partner, experienced technical difficulties that led to many buyers being unable to see the bout. Live streaming sports is harder than streaming TV shows and movies -- like Netflix Inc. (NFLX.O) does. That’s mainly because live sports is only available for a few hours, making it vulnerable to crashes when many people watch at the same time. It’s also more complicated. It involves taking a feed, ensuring it works on devices such as Xbox or Roku, encrypting it, inserting ads, then handing it off to a third party for delivery to an internet provider -- all in real time. A crash means viewers can miss a thrilling touchdown, buzzer-beater or a missed putt. That hasn’t stopped tech companies from pushing deeper into sports. Amazon now hosts Thursday Night Football and is reportedly bidding on regional sports networks. In 2015, WarnerMedia’s Turner Broadcasting bought a majority stake in a company called IStreamPlanet to help with its own streaming efforts. WarnerMedia said this weekend that it’s still investigating the cause of Friday’s glitch. Friday’s golf event was supposed to showcase AT&T’s media prowess following its US$85 billion purchase of Time Warner Inc., the owner of HBO, Warner Bros. and Turner. AT&T and other pay-TV providers said they’d issue refunds to customers who paid to watch the match. There weren’t reports of problems for telecasts on cable and satellite TV.